We already know so much about Marilyn Monroe (born Norma Jeane Mortenson) – the multiple books, films, documentaries, interviews with people who knew her, interviews with people who saw her from afar once – that it’s hard to imagine how a new play could bring to light anything unknown. So it’s quite a relief to discover that ‘Goodbye Norma Jeane’ isn’t really about her at all. Liam Burke’s script tells the tale of unsung hero Jack Cole (Tim English), Hollywood choreographer and, apparently, the real talent behind the stars. The story is set in the golden age of Hollywood – satin gowns dripping with diamonds and fur, debauched pool parties, decadence and glamour for days. 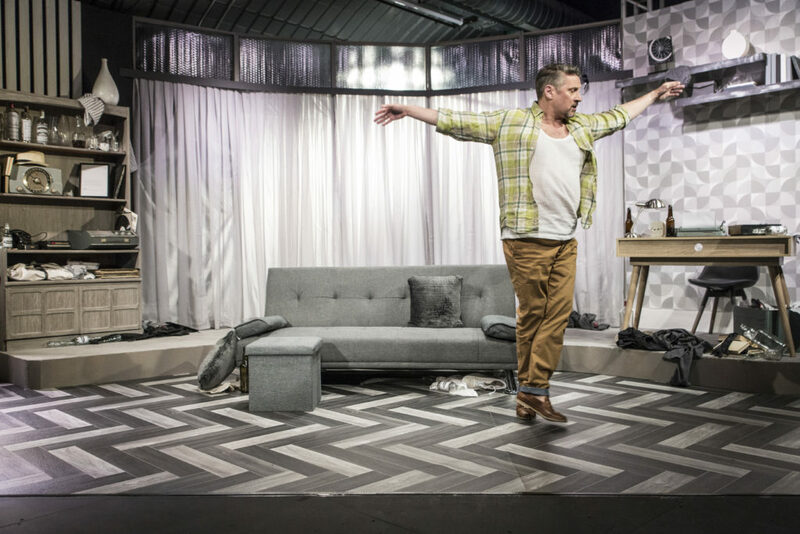 Unfortunately, the set design (Stewart J Charlesworth) tells another story – a lot of grey furniture, and a lot of empty bottles. Presumably the latter are supposed to insinuate that a good time has been had, but the effect is quite the opposite. For a man who claims to have given dozens of stars their sexiest and most iconic moves, English portrays a very understated character. There is a lot of bitterness in the script – “I made Gwen like I made the rest of them”- but English misses it completely, favouring head-shaking disappointment and unconvincing humility, perhaps in an attempt to make Cole more likeable. We’re also left straining to hear his very patchy American accent at times as he struggles to make himself heard. Rachel Stanley, playing all of Cole’s ‘muses’, is an entirely different animal. She’s a triple threat – singing, dancing and acting – and whilst a lot of her performance is quite hammy – introducing every new character with a shimmy in a spot-lit doorway for example – her delivery is entertaining and, at times, quite funny. Admittedly, I imagine it would be quite a challenge to anyone to bring the glamour and tragedy of Monroe-esque Hollywood to a small fringe theatre, but it’s hard to see where Robert McWhir’s direction even attempted it. Everyone loves a story of a forgotten hero, and Jack Cole’s contributions to cinema and dance certainly make him a contender for such a tale, but unfortunately ‘Goodbye Norma Jeane’ does little to reinstate his forgotten Hollywood legacy.